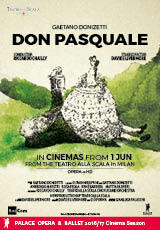 La Scala: DON PASQUALE | Movies | Palace Cinemas | Share our passion. New Production! Riccardo Chailly's journey through the Italian repertoire, which in 2017 brought back Rossini's The Thieving Magpie, continues with Donizetti's first title Don Pasquale. Davide Livermore's new production will see Ambrose Maestri, the Falstaff par excellence of these years, take on the title role, another figure suspended between comedy and melancholy with the disillusion of time. With him, Rosa Feola, as Norina. Captured live from Teatro alla Scala, Milan, 19 Apr 2018.